Hi! 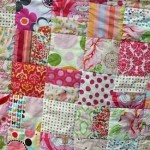 Stephanie from Swoodson Says, back with another softie pattern. 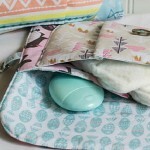 I have been on a roll recently – my kids have been “swimming” their merman doll all around and baby sister has been snapping shots with the Little Photographer’s Camera she inherited! 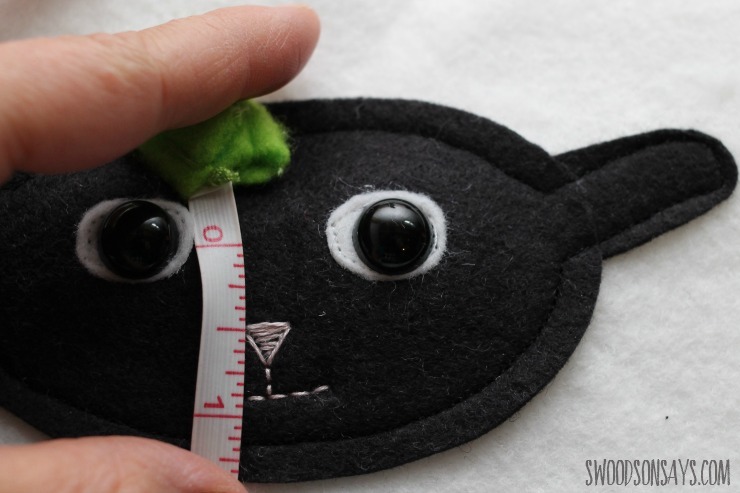 This printable sewing pattern is sure to be a hit, too. 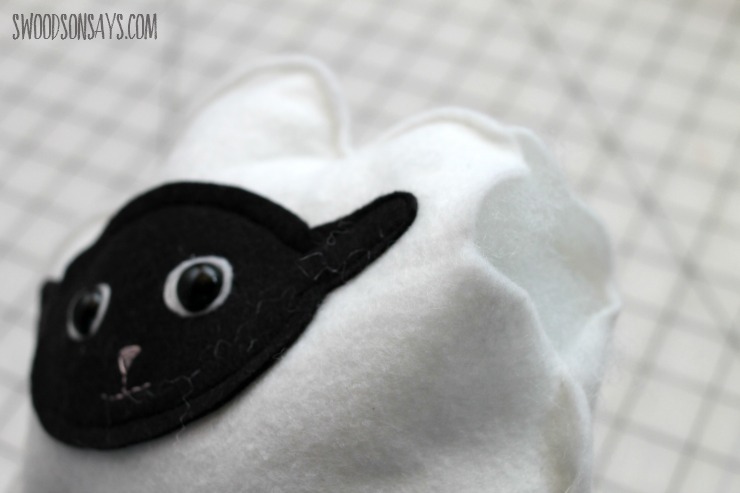 This little sheep is super simple and sweet, but the graphic black and white make it perfect for a baby. 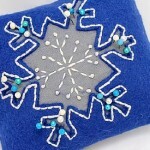 It’s a cute free pillow pattern with many uses. 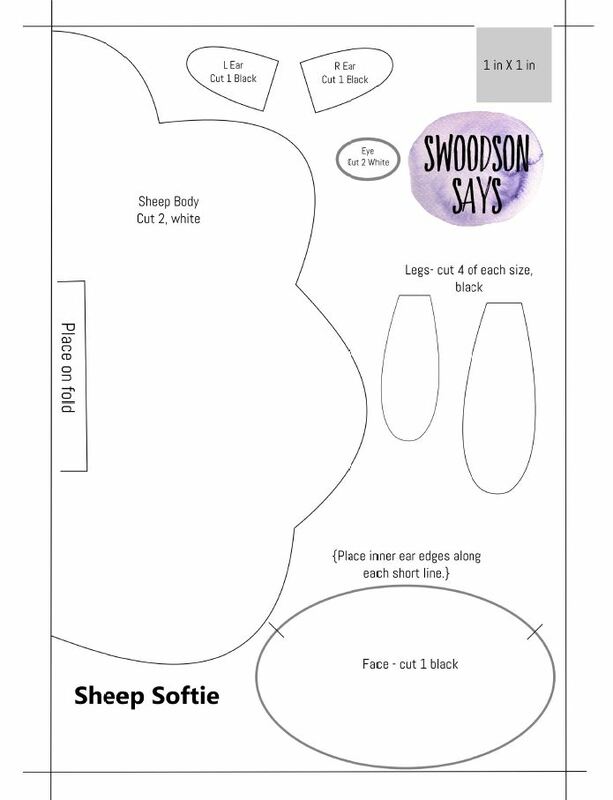 Enlarge the pattern to make a sofa cushion or shrink it down for a pocket sheep! 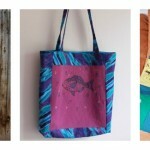 Note: Click here for a printable pdf of this pattern! 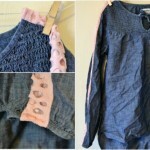 Use the placement marks on the pattern piece to attach each ear, using a glue stick to temporarily baste on. 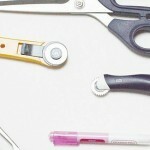 Use the awl to punch a hole in the middle of each white eye and then use the glue stick to baste them on. The outer edges of each eye should be 2” apart from one another, and vertical placement is centering each eye about 1” down from the top of the black face. 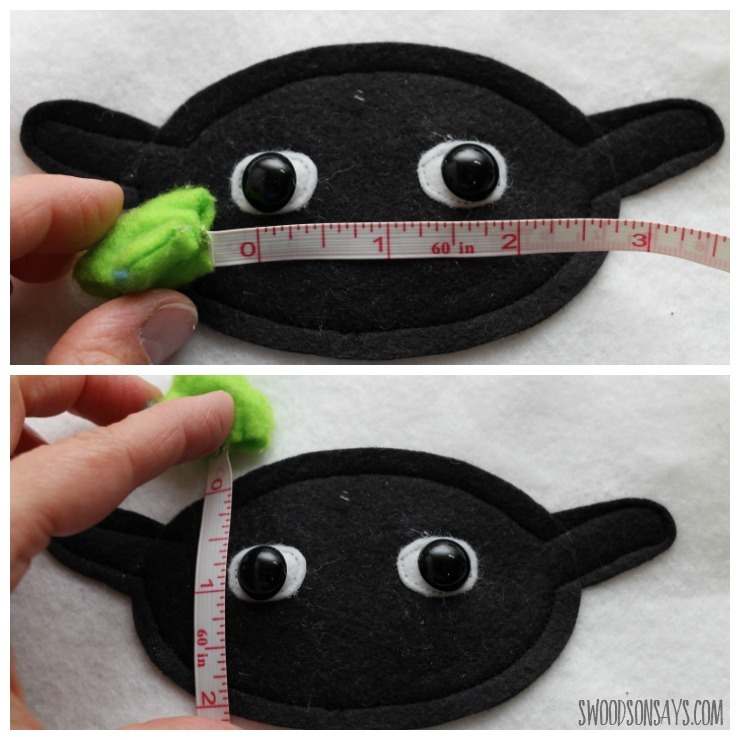 Stitch the white eyes on, and then place the face centered, about 25” down. Stitch the face and ears on. Insert the safety eyes after pressing the awl through all the layers, punching a larger hole. 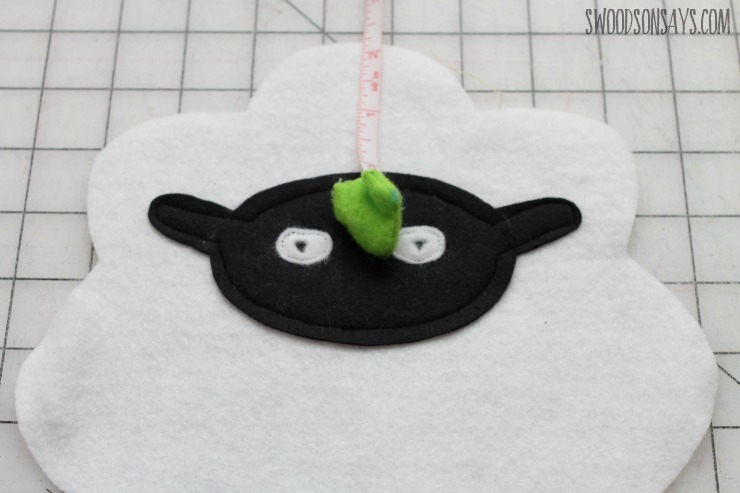 Thread the embroidery floss ( I used 2 strands) and stitch a small nose with a backstitch and satin stitch to fill, about .5” down from the center of the eyes and centered in between. 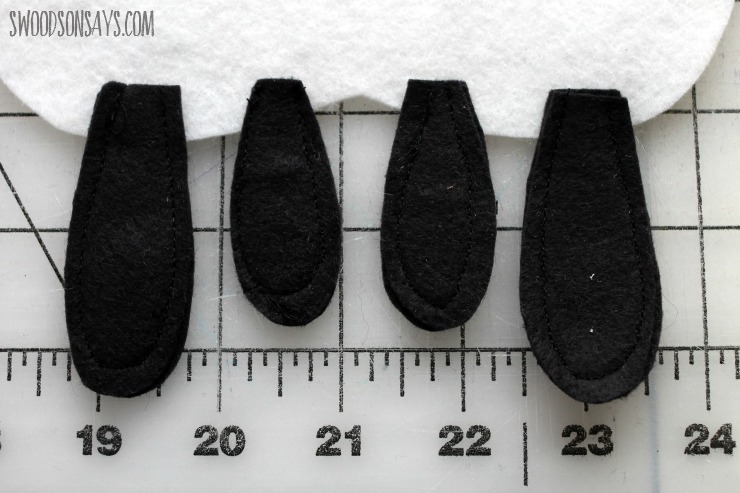 Sew the four sets of legs together, and then starting from the bottom center place them .25” from the middle and then from the next leg over, on the other body piece that does not have the face. Use a glue stick to baste on. 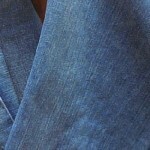 Place the two body pieces wrong sides together, encasing the raw leg edges in between. Sew along the edge almost all the way around, making sure to catch the legs in the seam, and stopping and starting with a 2” gap, insert stuffing, and then sew that opening closed. 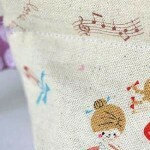 Trim your loose threads and enjoy! Now, try to keep it away from any kids if you want to take pictures because it will immediately be hugged and made dirty! 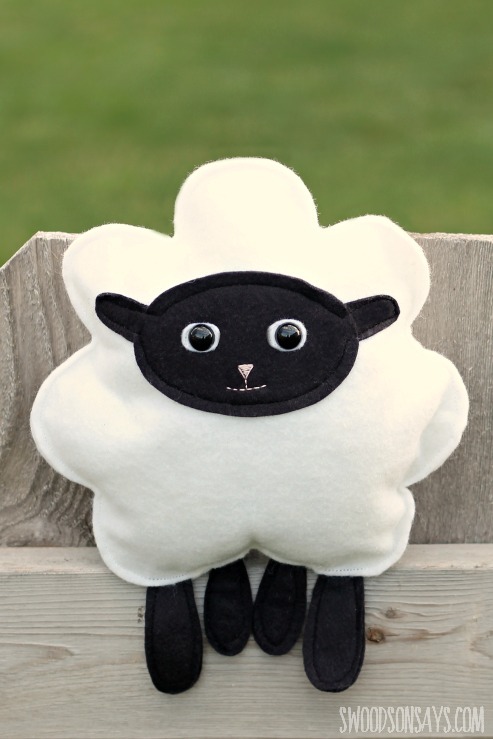 I think it would be cute to make a little herd with black and grey sheep too. 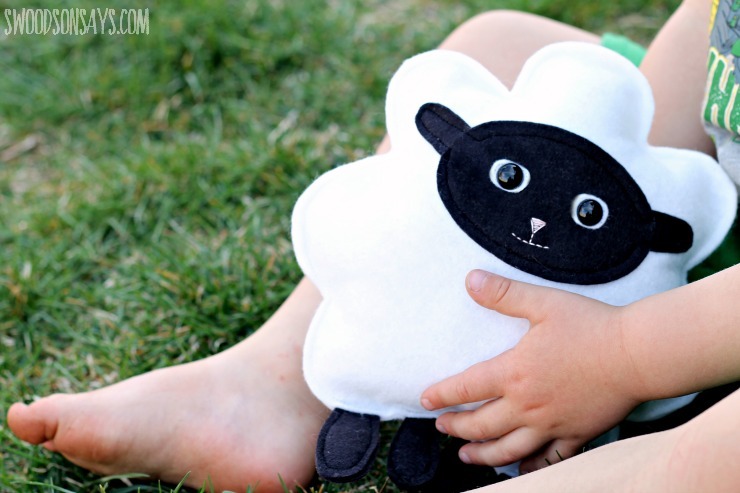 Would this free sewing pattern help your little loved ones count sheep?